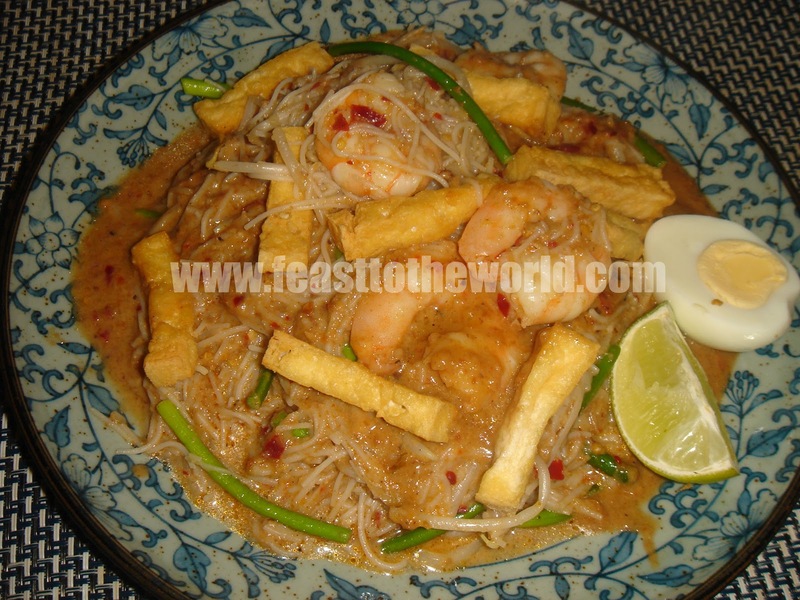 This is a popular dish in Singapore and is also a favourite of mine. Back in my primary school days, I would almost certainly be eating this everyday during recess time in the tuckshop /canteen. It was one of those dishes that was immensely satisfying with a full-on explosions of wonderfully hot, sharp and spicyflavours, very moreish and comforting. What's really good about this noodle dish was that it filled me up which was essential as when you were young, being hungry meant a lack of concentration in classes, definitely one of my biggest problems. I would always daydreaming about all the delicious food that were served in the tuckshop/canteen - spicy curried chicken wings, fish balls mee pok ( dry flat noodles), mee goreng and of course mee siam. When the bell rang, I would jump out of my chair and rushed to queue up in front of the stall for this deletable noodles. 50 cents, that will cost me and then I would spent another 40 cents on two spicy chicken wings and the last of my pocket money on some chilli fish balls......yum! Looking back on it, I must have been a greedy child and perhaps a mini foodie in the making back then. Food seemed to be dominating my entire childhood memories! It might takes a while to prepare the paste, gravy and the garnishes but they can all be made well ahead in advance. Once all these are done, it only takes seconds to put it all together when you are ready to eat. The ending result is something so delicious that you won't regret it. One of the best street food to ever comes out of Singapore. Pound the ingredients for the rempah/spice paste in a mortar and pestle into a paste. Alternatively, blitz them in a food processor. Heat the oil in a wok or large pan over medium heat. Add the spice paste and cook for 8-10 minutes, stirring constantly, until golden brown before removing from the heat. 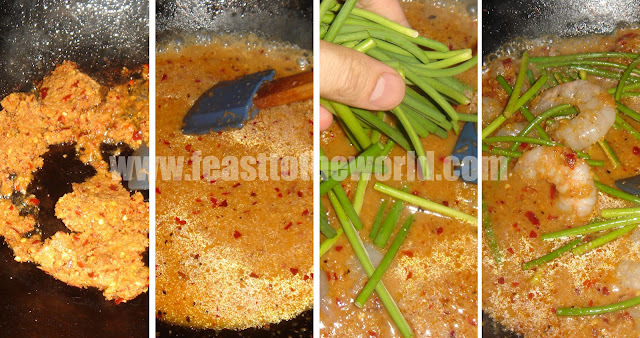 To prepare the gravy, place half of the spice paste into a pan and heat over medium heat. Add the yellow bean paste, tamarind purée and sugar, cooked for 30 seconds before adding the coconut milk and water. Bring to the boil and simmer for 30 minutes until it turn deep golden brown and the oil from the coconut milk has separated. Season with salt and freshly ground black pepper to taste. Keep warm over a very low heat. Heat the remaining spice paste in a wok over medium heat, add the water and bring to the boil. 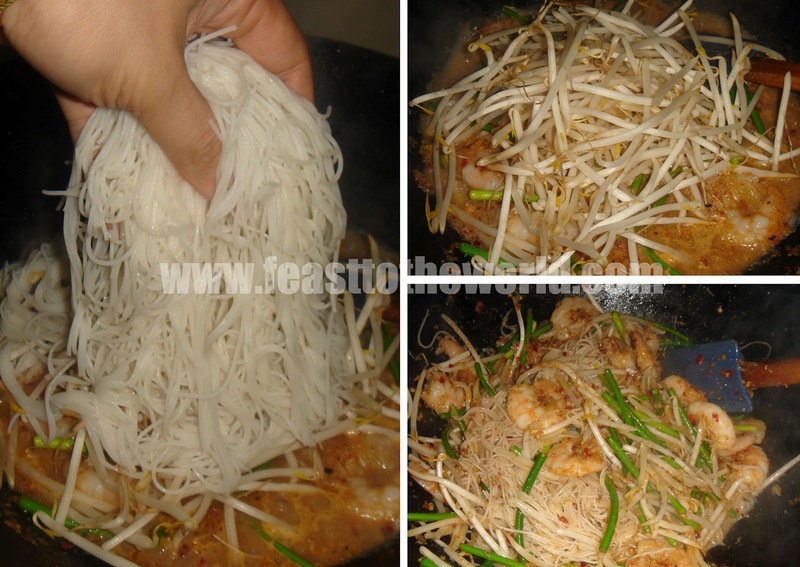 Add the garlic chives, prawns and cook for 30 seconds before adding the bean sprouts and rice vermicelli, a little at a time and stir to mix thoroughly. Cook for another 2 minutes and transfer to a serving dish. 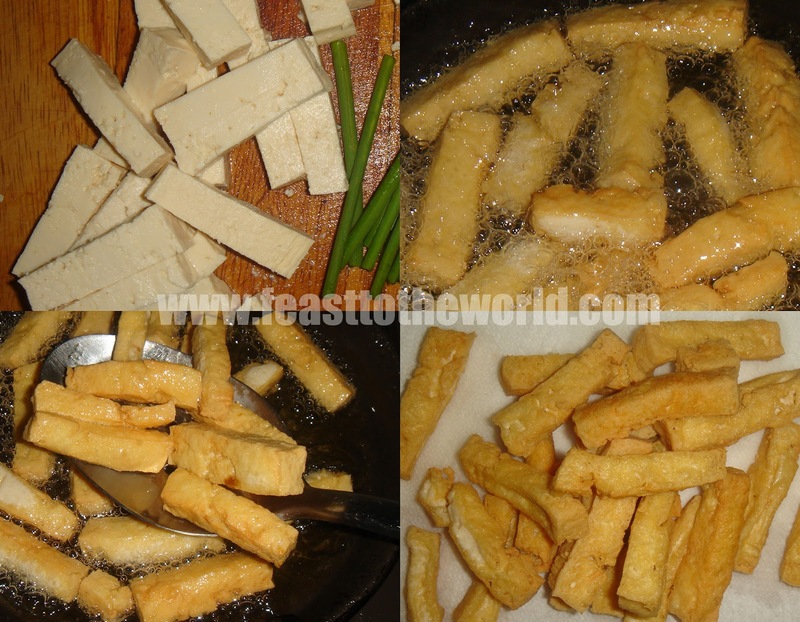 Top with the fried tofu, egg and lime and served with the gravy in a separate bowl or jug. Pour the gravy over the noodles just before eating with a squeeze f the lime. 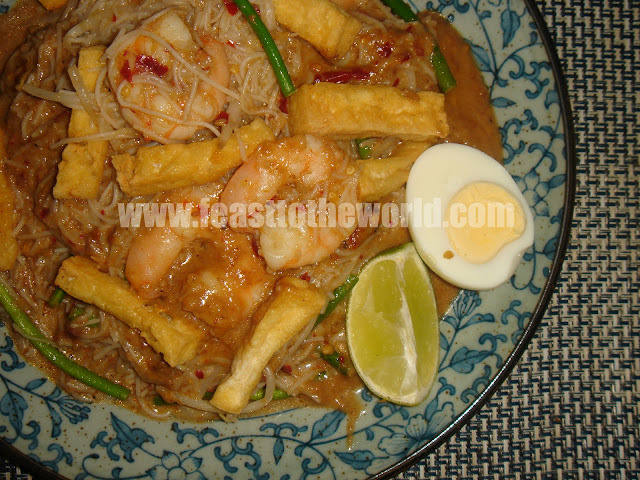 I enjoy mee siam too and is glad that you are able to find good ingredients for this lovely dish. Keep up the good word and spread our lovely food culture all over the world!